Growing older and wiser: researchers reveal a subset of old fibroblasts that promote reprogramming more efficiently than their counterparts. 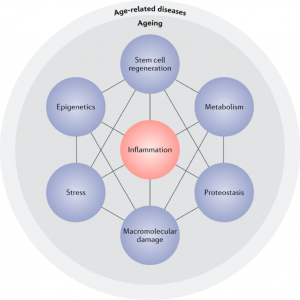 As we get older, our cells tend to produce elevated levels of pro-inflammatory cytokines. Over time, this leads to chronic inflammation, which is a hallmark of many chronic ailments such as cardiovascular diseases and fibrosis (Figure 1).1 Though reprogramming of mesenchymal cells has been effective in treating some chronic inflammatory conditions2, new findings such as presented in this study show that there exists a remarkable level of heterogeneity between aged fibroblasts, contributing to varying levels of efficiency in reprogramming. Understanding how this heterogeneity impacts reprogramming is key to being able to personalize treatments in patients with age-related diseases. Figure 1 from Franceschi et al., 2018. The Seven pillars of ageing. The authors show a marked upregulation in pro-inflammatory cytokines, such as IL6 and TNFα, in plasma from old mice vs. young mice, also observed in conditioned media from cultured human fibroblasts. Strikingly, conditioned media of iPSC lines derived from old fibroblast cultures no longer contained increased levels of inflammatory cytokines, suggesting that reprogramming the cells also erased their pro-inflammatory state. A caveat that the authors then explore, is the increased variability of reprogramming efficiency of older cells. Through transcriptomic, chromatin and metabolomics profiling, they were able to conclude that an ‘activated’ fibroblast state is key to successful reprogramming. A few key features of these activated fibroblasts were their highly proliferative state, expression of the transcription factor EBF2 and secretion of ECM components (Figure 2d); yet the heterogeneity among old fibroblasts was identified in cell extrinsic rather than intrinsic factors. The authors concluded that secreted IL6 enhanced reprogramming efficiency, whereas TNFα reduced it; further, that blocking of TNFα reduced the variability in reprogramming efficiency between activated and non-activated old fibroblasts, and could be a key driver of diminishing plasticity in these cells. This paper underscores the need to understand variability in reprogramming, and that both cell intrinsic and extrinsic factors should be examined to identify key drivers of this variability. Additionally, there have been an increasing number of studies showing that pro-inflammatory cytokines can have both damaging and protective roles in chronic inflammatory diseases. This study once again alludes to this dichotomy, and challenges us to be specific and careful when examining directionality of effect based on the disease in question. The authors allude to tissue heterogeneity as well as cellular heterogeneity; how might reprogramming cells in age-related diseases that affect different tissue types change? Would changes in systemic inflammatory milieu affect global reprogramming efficiency? Does this activated fibroblast subset also exist among “good” young fibroblasts? Additionally, would increased reprogramming efficiency of activated fibroblasts not only contribute to wound healing, but also to fibrosis? How would this be controlled? More investigation into these issues and why variability of reprogramming exists in patients with the same condition will help us target personalized approaches to managing chronic inflammatory conditions and wound healing. Franceschi, C., Garagnani, P., Parini, P., Giuliani, C. & Santoro, A. Inflammaging: a new immune-metabolic viewpoint for age-related diseases. Nat Rev Endocrinol 14, 576-590 (2018). Flavell, S J et al. “Fibroblasts as novel therapeutic targets in chronic inflammation” British journal of pharmacology153 Suppl 1, (2007): S241-6.